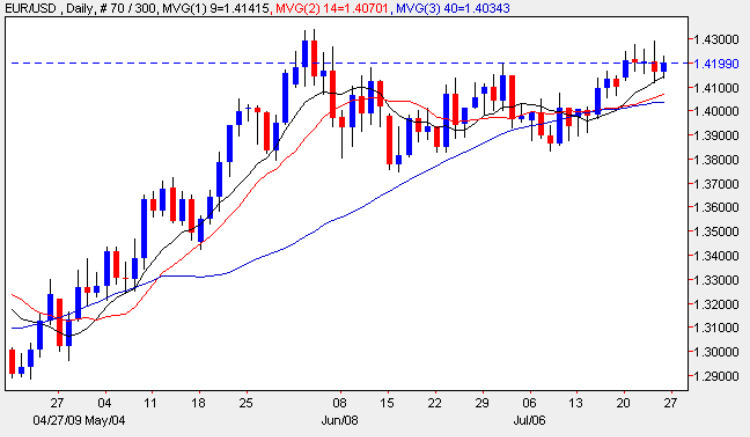 Following on the back of two doji candles on Tuesday and Wednesday for the euro vs dollar pair, yesterday’s price action has reinforced this bearish picture with a shooting star candle which once again failed to breach the 1.43 resistance level which is now becoming increasingly important. As we can see from the daily chart, the euro dollar has now tried to penetrate this level on five separate occasions since early June, and each time has fallen back to close lower in the trading session, with yesterday one of the clearer signals of the pattern. However, it is also very interesting to note that the low of the day found support from the 9 day moving average, suggesting that we now need to wait for this signal to be confirmed in the next few days. For a move higher we MUST see a break and hold above this level, which will then provide a springboard to a move higher, whilst any move lower will only be validated by a hold below the 1.38 price handle. This morning saw a string of fundamental news items on the economic calendar for Europe, all of which came in better than expected. These included the German and French Flash Manufacturing and Services numbers along with the German IFO business climate index. In the US this afternoon, the main piece of news is the testimony once again by FED Chairman Ben Bernanke who is due to testify, along with Treasury Secretary Timothy Geithner and Federal Deposit Insurance Corporation Chairman Sheila Bair, on regulatory restructuring before the House Financial Services Committee, in Washington DC. Prior to this we have the University of Michigan ( UoM) consumer sentiment index which is forecast at 65.1 later today.